Maternity shoot? The story below will really get you emotional!! When Amanda and Jesse Snyder learnt they were expecting their first child, they were overjoyed. However Jesse who stood by his wife throughout the first months, died in a tragic accident on May 27. “He was there for every appointment, he was there right next to me when I was so sick I couldn’t leave the bathroom or my bed, and he did everything he could to show his love to me,” Amanda told HuffPost. 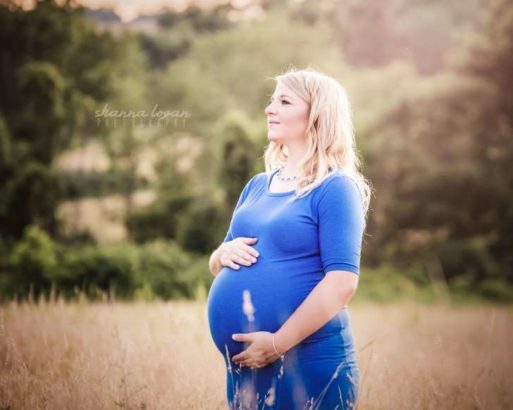 For her maternity shoot, Amanda who wore a blue dress and posed for photos by photographer Shanna Logan at Logan’s family farm in Mt. Pleasant, Pennsylvania, decided to include her late husband in the photos. It was also gathered that She had picked out a matching shirt for Jesse but she ended up using it for his burial outfit. 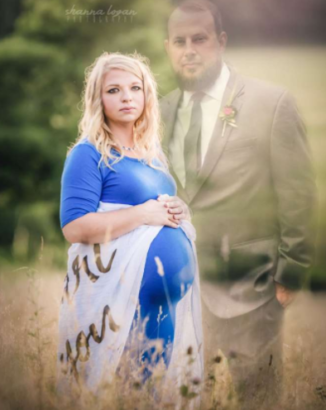 Logan said she had never Photoshopped a lost loved one into a picture but she had seen other photographers do it so she used photos of Jesse from a few months before his death to bring Amanda’s vision to life. Amanda gave birth to Jameson at 6:37 p.m on August 2. 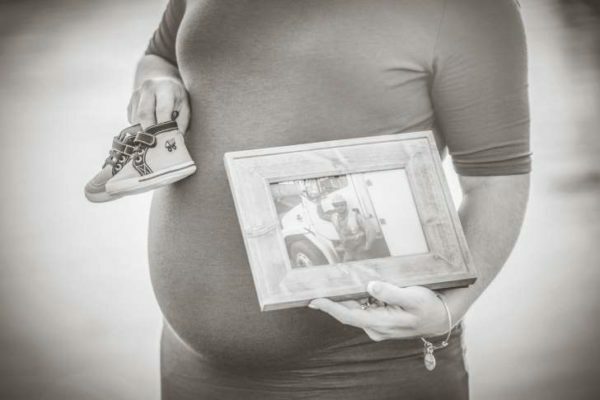 Throughout her labour, delivery and postpartum recovery, she kept a photo of Jesse next to her. 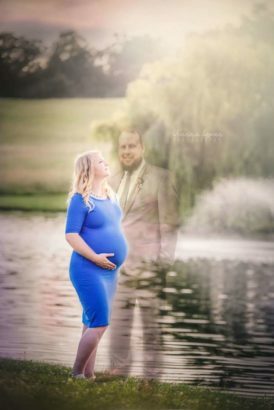 Coincidentally, Logan called her and left a voicemail to say she’d finished the photos at 6:36 p.m. – the same time Amanda welcomed her child. Amanda was overwhelmed with emotion and began to cry when she saw the photos the next morning. 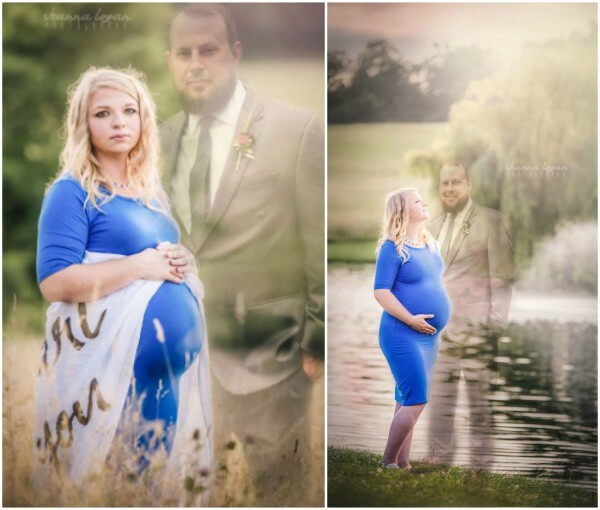 Logan shared the maternity photos on Facebook, where they’ve reached nearly 10,000 likes. 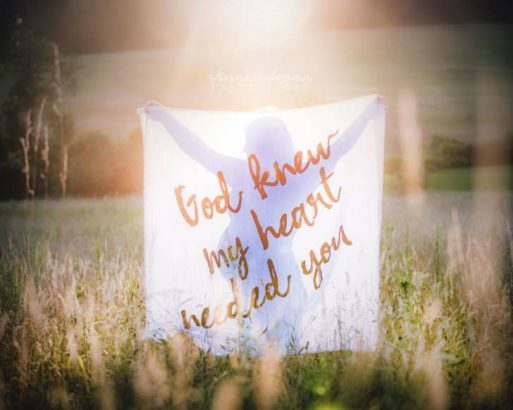 Amanda said she did not expect her photos to go viral, but has been touched by the kind words she’s received from strangers, especially other women who have lost their partners. She added: “The hardest part was leaving the hospital and not having my husband be the one driving us home for the first time and knowing he wasn’t going to be there to help me. She said her father and close friends have come together to support her. Amanda says she’ll forever be “Jesse’s girl.” She hopes Jameson will inherit some of his dad’s wonderful qualities. “My son is the most amazing gift Jesse could have left me with. He has this grin that is exactly like his daddy’s, so when I look down and see it, I see my husband,” she said.